We ALL have a story, and the stories we tell define not just who we are as an individual, but also the Society we create, our values and beliefs. In days gone by we created culture by using stories and myths to give a sense of form and meaning to our lives, to give us a sense of connection and life’s mysterious ways and to help us understand and have a framework for them. Myths are full of archetypal themes and characters and these help us to not just connect to life and its mysteries but give us a blueprint for how to handle the major recurring themes we are all likely to face at some point or other – the Hero’s Journey for example. They help us understand who we are and how we can overcome the odds, and the challenges we face. We hunger for this at an unconscious level – most of us today have lost this primal conscious understanding of how these stories connect us to our culture and ourselves, but that doesn’t mean our psyche doesn’t need them. We see them as entertainment only, but respond avidly to any film, TV series or book that speaks clearly to archetypes, the hero’s journey and the whole cycle of initiation embedded in the mysteries. Themes such as this play out again and again in all the best screenplays and books, albeit we are largely unconscious of them now. For many years I have been fascinated by myths and legends from a wide variety of cultures. Some I find easy to access the archetypal imagery they carry, some the culture is quite alien to that I grew up in and it is there more difficult to relate to, but all of them speak, in one way or another, through a rich vein of imagery that has a deep inner wisdom to guide us – if we only knew how to listen to them! For we have to ‘hear’ the deep symbology they contain and ‘see’ the archetypal patterns they represent – and modern cultures no longer give us these skills as a matter of course. Our sense of place, of who we are, is rooted in these stories, and yet we have lost touch with them. I live in a country that no longer has a strong sense of its own identity in the world partly, I suspect, because we no longer treasure our stories. We have opened our doors to multi-culturalism, and lost a strong sense of our own identity in the process. Whilst embracing the culture of others we have neglected our own. It has fascinated me to see that, as much as we might embrace other people’s stories and ways, it is clear that we need to do this coming from a strongly rooted sense of our own. Otherwise, it seems to me, nothing seems to quite fit. Growing up in Great Britain, the myths I most came in contact with were Classical. Like so many of us in the Western World I found these referenced in all the great works from Shakespeare to Milton. I grew to love them, and studied them, and the archetypes they represented in great detail. It wasn’t until many years later that I began to realise that despite my deep love for them, they didn’t engage me at a visceral level. I didn’t feel these stories in my cell tissue, because they weren’t rooted in my DNA, in the lands of my ancestors. And when I looked to see where the Ancient British stories were kept alive in our drama and poetry and public consciousness all I really found were dusty tomes hidden in libraries. We didn’t talk of Bel or Belinus the sun god, but of Apollo, nor of Taranis the god of thunder, but Thor. That got me thinking about what had happened to our native wisdom because when I looked around I realised so much of what makes up our society is borrowed from another culture. Christianity comes from a Hebrew base and yet what few people realise is that one of the reasons it was so easily accepted in these Isles is because the Druids taught a very similar story and saw the Jewish Messiah as being the embodiment of this. Much of our New Age knowledge comes from an Eastern base – chakras for example. And yet there is our own native understanding of our energy body, including the chakra system, which the Ancient Britons saw as being spiral rather than linear – but you have to dig deep to discover this. 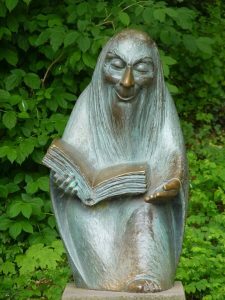 The myths we are most aware of are Classical, Norse or Egyptian, our fairy stories are from Europe not home-grown. It is easier to find a shaman pulling on South American, North American or Russian influences than one using our native shamanistic practices. It is clear that as a culture we both respect and are open to the influence of other cultures, we are not the ‘little englanders’ some try to make us out to be. And this can only be a good thing -but it is not inward-looking to cherish and respect your roots. Roots are important in all sorts of ways. We have suffered because these myths and stories of our ancient past and our land were a living tradition, passed down with great reverence from generation to generation and they only started to be written down as this tradition was lost with the advent of Christianity. Most of what we have has been recorded by Christian monks who inevitably censored, judged, re-wrote or put their own overlay on them to suit their own sensibilities. It is believed that our best and most original sources are Welsh – the ancient British were beaten back to Cornwall, Wales and Scotland by the invading Roman, Anglo Saxons and Norman – and yet it is said that only a fraction of what lies in these archives has been translated and is available to us. Why do we not value our own stories, our own deep history in the same way we value that of later incomers? It is said that the Romans made a deliberate and concerted effort to wipe out the druids, who were the holders of the Ancient British wisdom traditions, stories and culture. They considered destroying this as being the fastest, most effective way to conquer a people. And they were right. Two thousand years later we are still borrowing from others to fill the void this opened up in our collective psyche. And yet….start to dig into our ancient past, our ancient stories, and what you find is rich and complex and many textured; A world where the goddesses are strong and independent and on the whole outshine the gods, a society where equality was the norm, where connectedness was integral, the sacred interwoven into everyday life. If we are looking for role models for the New Age, the ancient past of these lands, the Blessed Isles, has much to offer us.